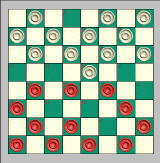 With Net Checkers you can play American checkers (English draughts) with friends and family on the same computer, via email or online over the Internet or local network. You can choose between different computer opponents (checkers robots), skill levels and utilize various checkers engines (Zebra checkers engine is included). And it does not matter if you are a beginner, intermediate or professional player. With Net Checkers you can learn, practice and master your checkers playing skills. Net Checkers provides you with three game tables that easy to change. You can quickly setup and initiate the game session, whether online or offline, with computer or human opponent. Moreover, you can play several checkers games simultaneously, for example, one online against the human opponent and one offline against the computer. Rich options and contains a number of great checkers features. Provide time control (conventional clock, incremental clock and special modes) and ability to limit checkers engine decision making time without limiting yours. Support click-and-drag or click-and-click move options, board rotation and interactive move list. You can copy & paste the game with the help of clipboard, you can save it (with your comments, if necessary) in PDN format. You can play via e-mail with other checkers fans all over the world who have checkers software that supports PDN format - your opponents don't have to buy Net Checkers and you don't have to buy software they use for playing checkers. Animation of the match, highlighting last move, IP address detection, several boards to choose from, different sound and color schemes, customizable cursors, and so on. Net Checkers is a powerful and flexible program that lets you play American checkers (English draughts) against the computer players, friends and family. The rich options, which contain a number of great checkers features, allow you choose between different computer opponents, skill levels and utilize various checkers engines. With the design of allowance to copy and save the game in PGN format, you could play it via e-mail with other chess checkers all over the world who have chess software that supports PGN format - your opponents don't have to buy Net Checkers and your don't have to buy software they use for playing checkers. No matter which level you stand, with Net Checkers and its rich options you can learn, practice and master your checkers playing skills quickly. Fatman Adventures Episode IV : Christmas Gifts - Fatman, crystals, artifacts and stupid monsters, and many others make up this wonderful game. Championship Chess Pro - The Battle for the King has begun! Extreme Miniature Golf - Play Golf on your PC with more enjoyment! No Brakes - NO BRAKES: 4x4 RACING is a racing simulator for PC. 3D Chess Unlimited - 3D Chess Unlimited is a popular chess game in 3D. Brave Dwarves 2 September Pack - Game play without blood and violence for the whole family.